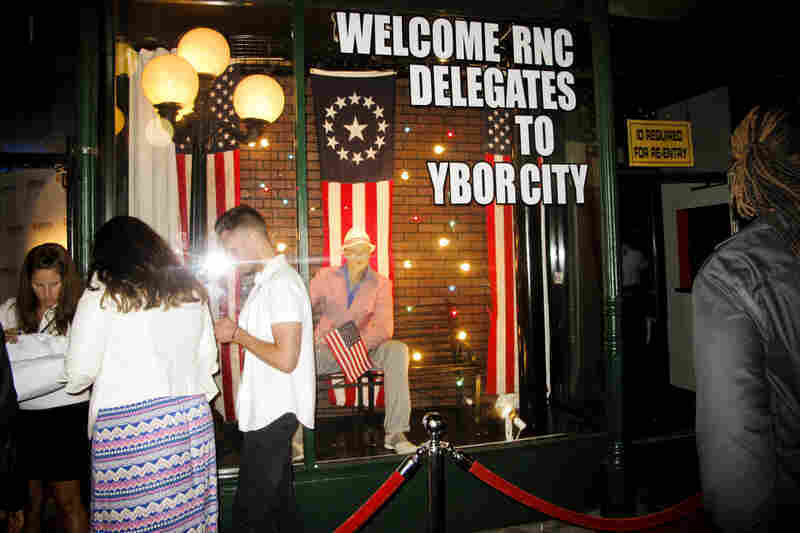 As Convention Day Winds Down, Tampa Hosts Republican (And Other) Parties : It's All Politics In Tampa, the phrase "Republican Party" can take on a whole new meaning as it gets later in the day. 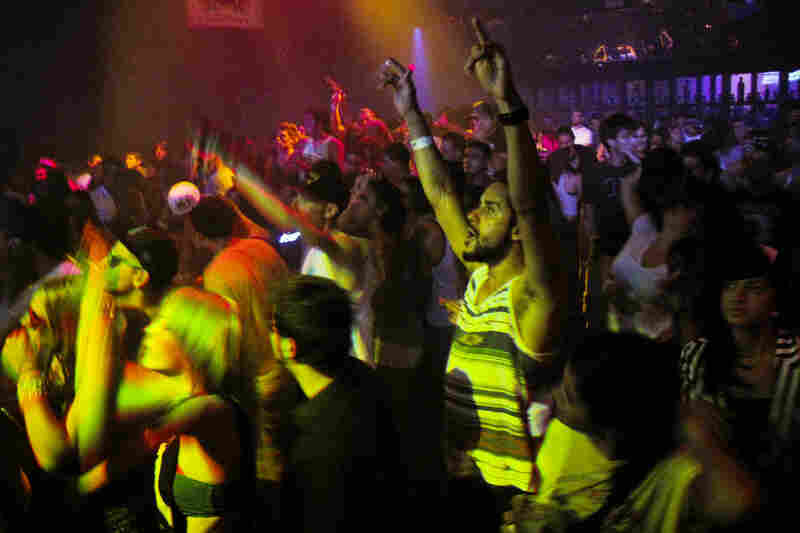 While politicians try to stir up emotions with prime-time speeches, nightclubs offer a different outlet. Rock the Vote, a nonpartisan group that tries to persuade young Americans to vote, hosted a party Tuesday at the Amphitheater nightclub in Tampa's trendy Ybor City district. 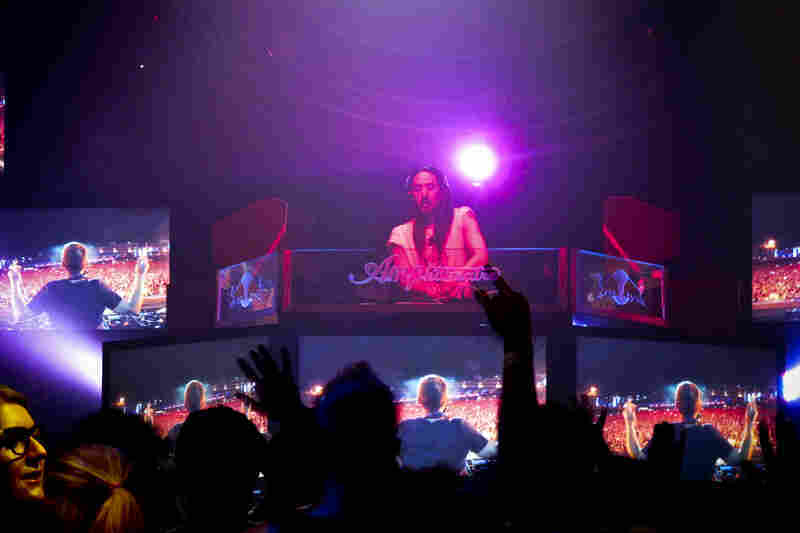 The featured guest was celebrity DJ Steve Aoki. As the audience danced to Aoki's beats, every now and then he urged the crowd to get out and vote. Rock the Vote's goal is to register 1.5 million new voters before the November election. "What's up Tampa?" Aoki yelled into the audience as the night wore on. 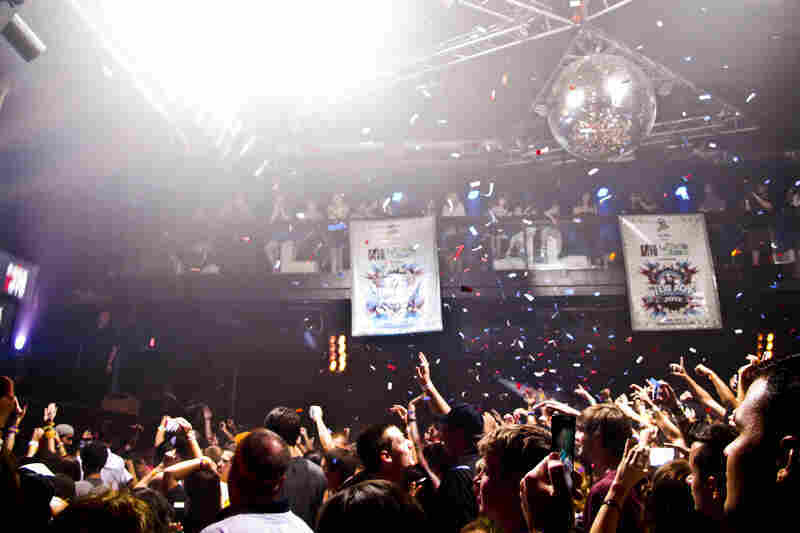 The dance floor and guests are covered in confetti at the Amphitheater nightclub in Tampa. 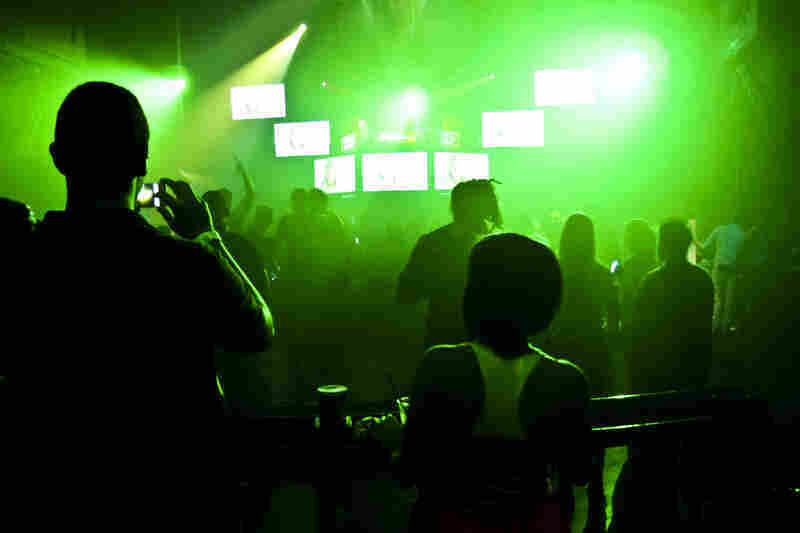 At the Honey Pot nightclub, an event called the "Homocon" was organized by GOProud. Outside the Honey Pot nightclub in Tampa's Ybor City district. There was a mostly young crowd lined up in front of the Amphitheater nightclub. Party attendees Taylor Schiller and Katie Glogowski had on their dancing attire — bikinis and fishnet stockings. It was a mixed political demographic here, including some Republicans — and some who don't identify with the GOP. Rock the Vote, the nonpartisan group that works to engage young people in the political process, organized this party. Tampa is the first leg on its planned road trip that will also stop in Charlotte, N.C., next week in time for the Democratic National Convention. The featured guest Tuesday night was not a politician but instead celebrity DJ Steve Aoki. 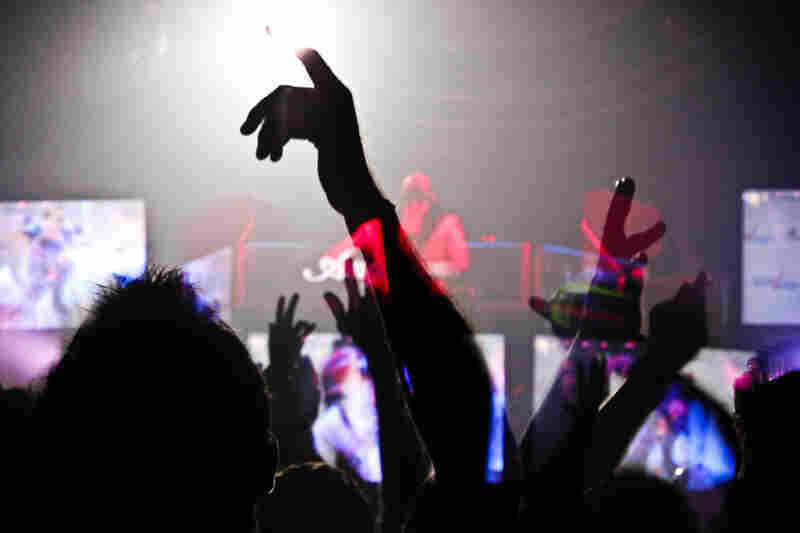 In a dark room full of thumping music, flashing disco lights and a couple of bars, it was pandemonium as Aoki stepped up to the turntables. "What's up, Tampa!" Aoki yelled, then urged everyone to vote. Rock the Vote organizers have a goal of registering 1.5 million voters in time for the November election. It's not clear how enthusiastic young voters will be for either presidential nominee. A Gallup poll found that 58 percent of voters ages 18 to 29 say they will vote in the general election compared with the national average of 78 percent. Four years ago, President Obama carried the youth vote. This year, Republicans are hoping Mitt Romney's running mate, 42-year-old Paul Ryan, will garner some attention and votes from younger Americans. The last stop on our night out was the Honey Pot for "Homocon," a party organized by GOProud, a group that reaches out to gay and straight conservatives. Will Clark, who just retired from the Navy after 30 years, was taking it all in — silver confetti, the dancers on four stages and the crowd on the floor. "This party, right here, is proof positive that they are opening their eyes to the fact that there's a lot of gay Republicans," saids Clark. "This is 2012. I mean, it's time to kind of get with this." Clark said he's excited about the presidential race and expects a close election. Tuesday night, though, it was all about dancing.